Auto body collision repair and painting. Free estimates, and photo documentation that can be forwarded to the insurance company. All insurance work welcome. 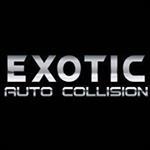 Look over our web page at www.exoticautocollision.com for additional information and location. Please call with any questions!